Formulated to enhance your skin’s natural moisture balance, these cleansing wipes gently sweep away impurities for oil-free, and makeup free, fresher skin! Help get rid of those shiny T-zones, and makeup residues! Oil Balancing Facial Cleansing Wipes –for oily skin or combination skin is rated 4.9 out of 5 by 11. Rated 5 out of 5 by Drcheeku from Magical Omg finally i found something for my oily skin..ihave a oily skin and by the end of the day my facelooks like a frying pan full of oil.my friend told me about these wipes i noticed a visible change in 1st week.i keep a pack in my bag and use it once a day i actually gives a refreshing look after the use and i apply some loose powder after using it a touch of my lipstick n im fresh again. Rated 5 out of 5 by Naem from Awesome It makes my skin pure and clean. 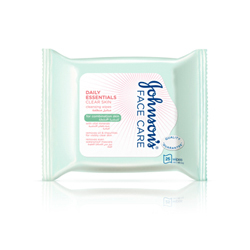 I feel my skin nourished, brightening and the pores become smaller every day I use Johnsin's wipes in the night before. Very recommended.. the best makeup wipes for my skin I've ever tried.